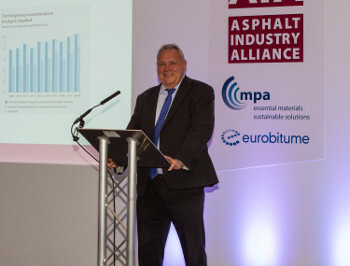 However, inconsistent funding is thwarting sustained progress, the Asphalt Industry Alliance (AIA) said. The ALARM survey’s headline benchmark figure for the ‘backlog’ – the estimated one-time cost to get local roads back into a ‘reasonable, steady state’ – rose this year from £9.31bn in the 2018 survey to £9.79bn, having fallen dramatically from £12.06bn in 2017. This breaks down at £69.9m per authority in England, £31.9m in London and £36.3m in Wales. However, the estimated time to achieve this is now estimated to be 10 years, down from 14 years in 2018. This year’s survey reports that for the second consecutive year, the highway maintenance budgets of English and Welsh local authorities have increased by almost 20%. However much of this appears to have been spent on reactive repairs with a 24% jump overall in the average number of potholes filled and almost 29% in England and London. AIA chairman Rick Green (pictured below) said: ‘It is encouraging that those in control of the purse strings seem to have recognised the value that additional expenditure on roads can deliver. But it’s clear from the 29% increase in the number of potholes filled in England and London that much of this has been used for patch and mend. This doesn’t provide value for money, nor will it improve the underlying structure and resilience of our roads. For councils in England this cash boost included a share of a one-off £420m cash boost in the 2018 Budget, although London’s boroughs and Transport for London (TfL) only received £20m of this cash, leading to complaints that it was ‘not getting its fair share’. 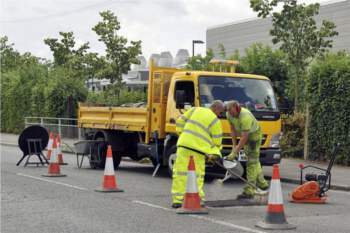 Average highway maintenance budgets up almost 20% – average annual highway maintenance budget is £24.5m, up from the £20.6m reported in 2018. £9.79bn – estimated one-time cost to get roads back into a ‘reasonable, steady state’. £657m – Annual carriageway budget shortfall (£4.1m per authority in England; £4m in London and £2.8m in Wales). 67 years – average time before a road is resurfaced (79 years in England; 28 years in London and 59 years in Wales). 17 seconds – a pothole is filled every 17 seconds. £26.7m – total cost of dealing with compensation claims, including £6.9m paid out in compensation. When compared to the size of each council’s network, further inconsistencies were thrown up. Mr Green added: ‘There are glimmers of hope but, while overall highway maintenance budgets are up, there is still a big discrepancy between the haves and have nots. Some local authorities received the equivalent of £90,000 per mile of their individual networks, while a third continue to struggle with reduced budgets, with several having less than £9,000 per mile to maintain their local roads. He said that in the absence of consistent funding, ‘the focus on primary routes continues’. Another key figure in the annual survey is the maintenance budget shortfall. This year, the AIA estimated the figure to be £657m, despite the extra cash, up from £556m in the 2018 survey. It said the new figure represents £4.1m per authority in England; £4m in London and £2.8m in Wales. While noting the rise in the one-time catch-up cost for the entire network, the AIA said the report shows there are ‘early signs that the extra money is halting further decline’, after years of underfunding led to a local road network ‘on the edge’. Councils filled an estimated 1,860,072 potholes during the year, representing 11,072 per authority at a rate of one pothole every 17 seconds. The average cost of a planned repair was estimated at £39.80 against £65.10 reactive, with authorities spending a total of £97.8m over the year just on filling potholes. The percentage of the network in a good state of repair has gone up by 2%, which the AIA said is the equivalent of an extra 3,500 miles of local roads reaching target condition. The survey found that 55% of authorities’ £24.5m average annual highway maintenance budget is spent on the carriageway, providing a carriageway maintenance budget of £13.5m. Around 57% of respondents said they would support a move towards a Totex, (combined total revenue and capital expenditure) approach, which would help drive further efficiencies and improve conditions, with others ‘citing causes for caution’. The figure is slightly lower than the 70% supporting the approach in the initial findings of the Chartered Institution of Highways and Transportation survey into ‘Improving Local Highways’. The 2019 ALARM survey was completed by 64% of authorities responsible for roads in England and Wales and carried out between December 2018 and February 2019. It includes the findings of both quantitative and qualitative research and the results were collated, analysed and verified by an independent research company. Its findings relate to roads maintained by local authorities and therefore exclude those forming Highways England’s strategic road network.